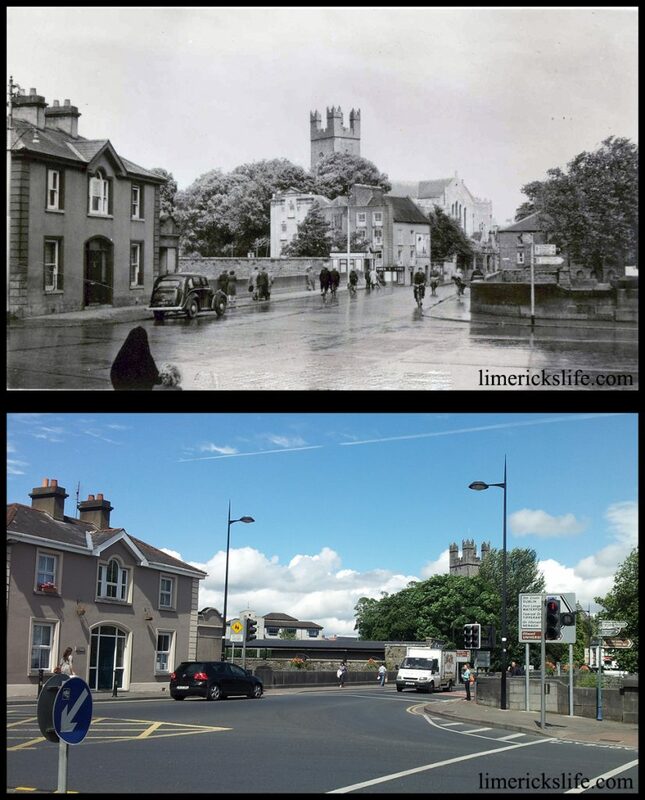 The following series of Then and Now images of Limerick city were taken in August 2013 to highlight how much has changed and how much has remained the same throughout the city. 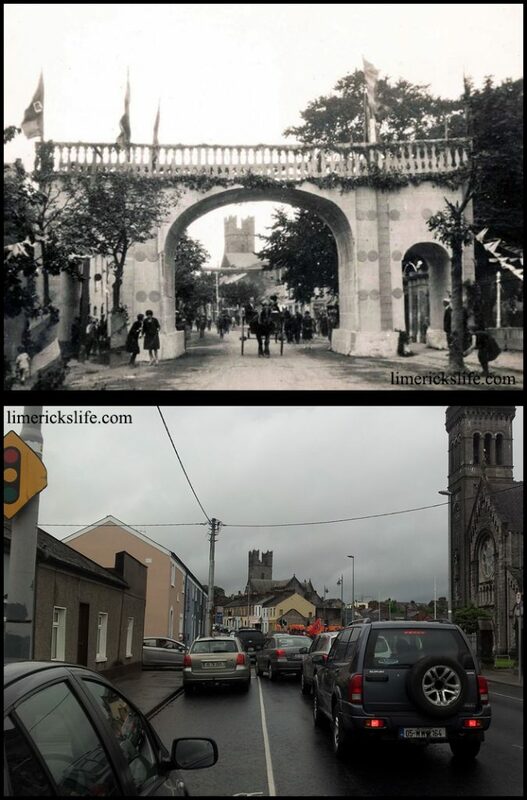 In 1932 false arches were placed on the entrances into the city in preparation for the Eucharistic Congress which travelled the country. This arch was on Athlunkard Street with St Mary’s Cathedral visible in the background. Dutch Billy style houses were a common feature in the Englishtown and Irishtown area. 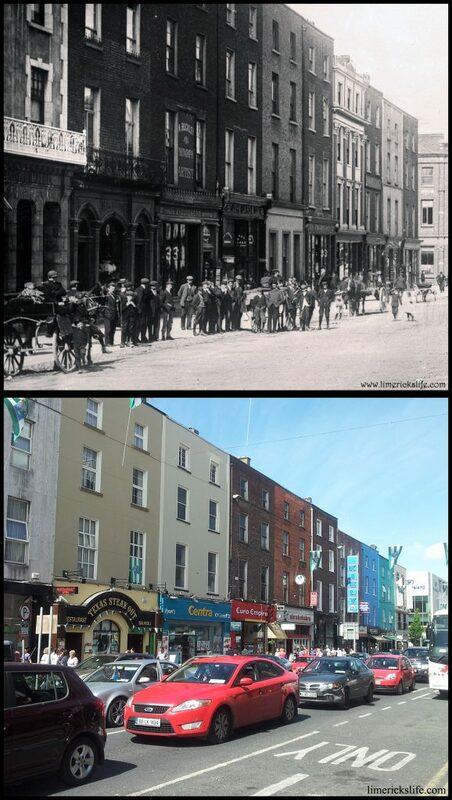 These were still visible c.1900 on Mary Street. Mathew Bridge photographed approximately 1950, you can still see the houses on Merchant’s Quay, one of these houses was the home of Dr Sylvester O’Halloran. Broad Street and John Street were the main streets of the Irishtown area of the city. This is one of the oldest streets in the city and even in the 1930s it was filled with traditional dress and transportation. 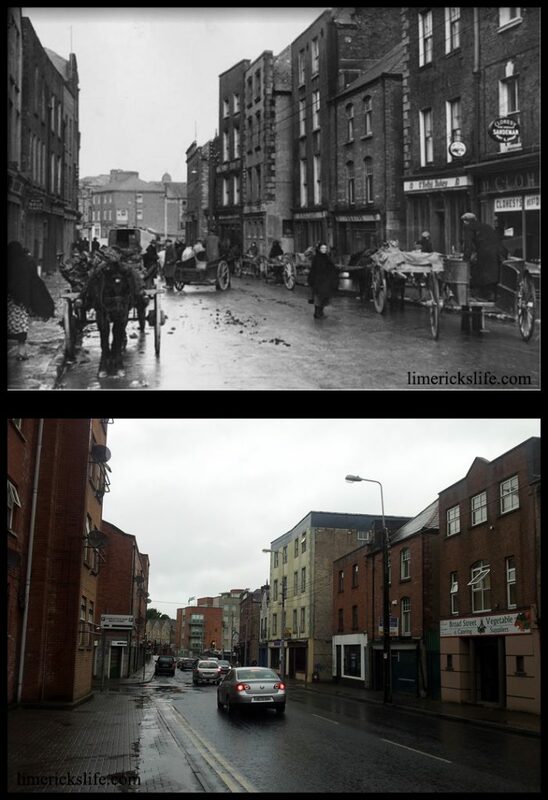 c.1890 Arthur’s Quay was still used, as it had been for generations, for the loading and unloading of goods. 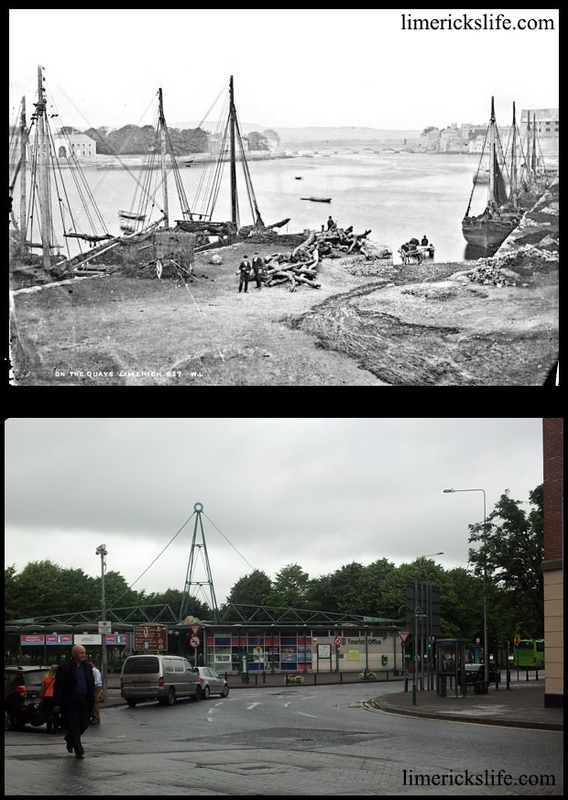 When this practice ceased the quay was filled in and used as a carpark before being transformed into the park we see today. 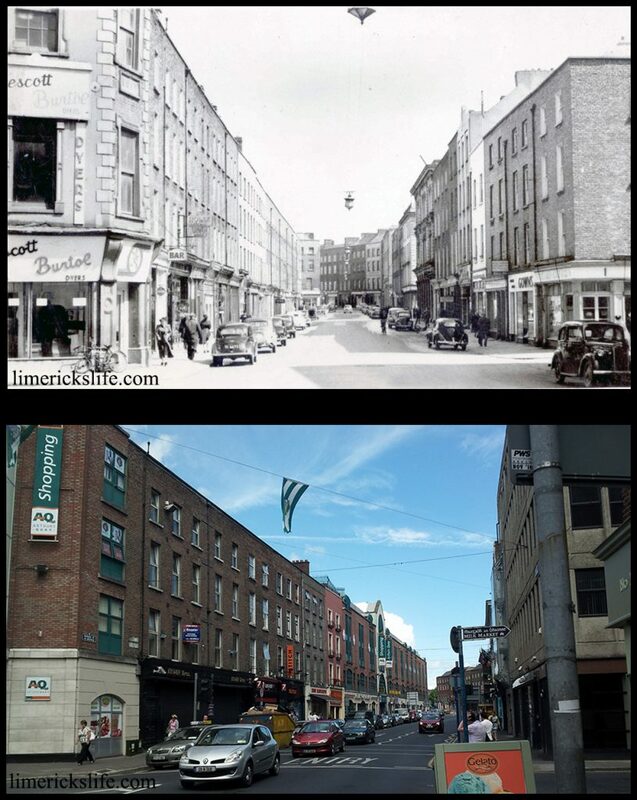 The original Arthur’s Quay and Francis Street buildings still stood in the 1950s. Irwin Brothers owned the building at 22-23 Patrick Street which was used by the family for over 100 years until it’s closure in 2011. At the turn of the last century the porch in front of the County Club encroached onto George’s Street. While straw hats were a popular fashion accessory of the day. 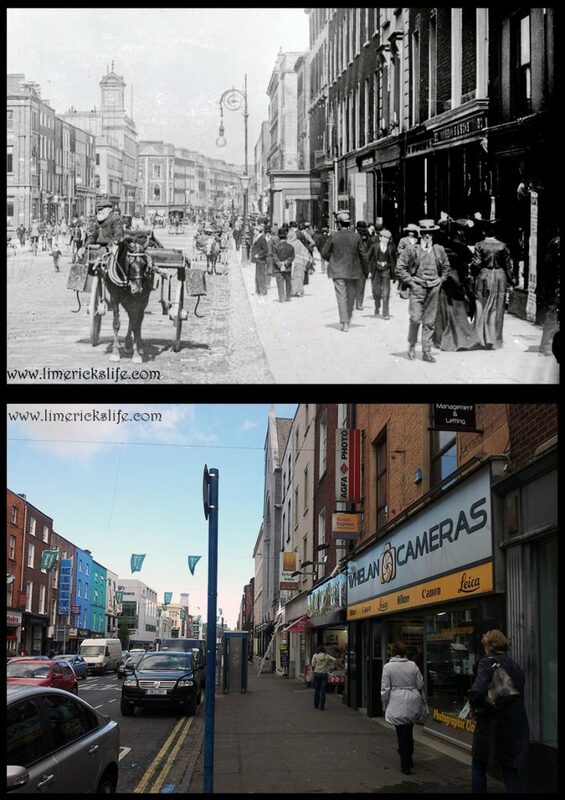 George Street now O’Connell Street (opposite to the image no.7). The shop frontages were far more ornate c.1900 and the group of boys seem to have been replaced with cars today. 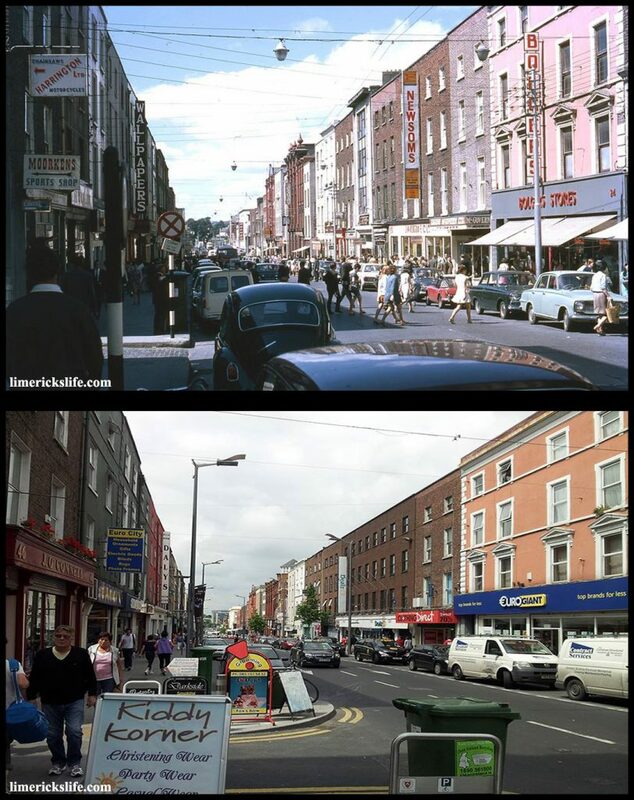 This picture from the late 1960s show how quickly the streetscapes can change with the redevelopment of Arthur’s Quay in the background. The shop once called Gaywear is became A-wear (no longer trading as of end 2013). Many of the shop names from the image of the late 1960s such as Newsoms, Bolgers and Boyds are still remembered today, though those businesses have long since closed. Fantastic project Chris, well done. I wonder would it survive today? Thank you Eileen, I am glad you gave enjoyed them. 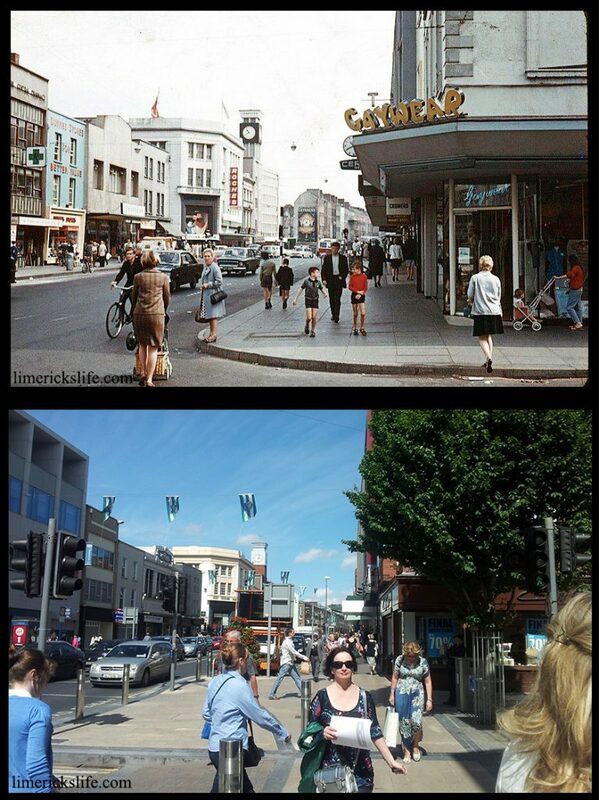 Like many cities it has become the home to cars as opposed to people. There are plans to reverse this and hopefully they will happen before it is too late. 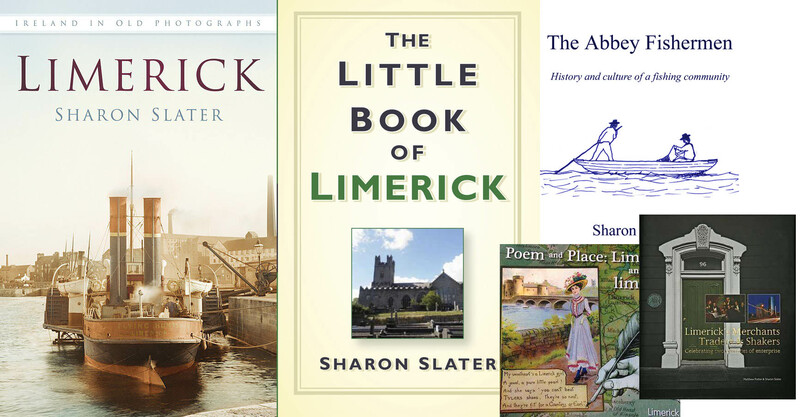 I have never been to Limerick but by looking at the photographs it looks a much more interesting place (then) than now. Of course that can only be based on the photographs and not personal experience, but that`s how it appears.